In addition to frequent project-specific feedback gathered by project managers and other team members, J-U-B’s Executive Committee conducts a more formal feedback process. This consists of in-person interviews with key clients—as recommended by our area managers and group leaders. 99% would be willing to recommend us to their peers! 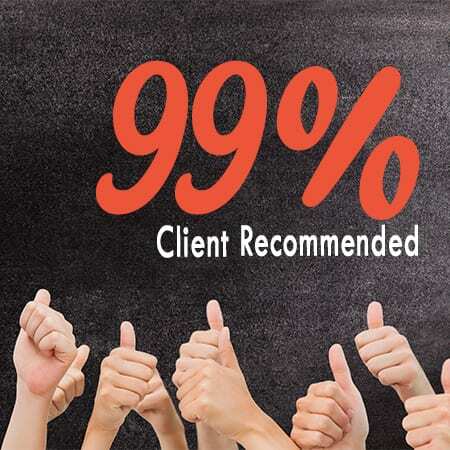 97% of those follow-ups were concluded to the satisfaction of the client. Over the last five years, J-U-B’s Executive Committee has conducted 442 client feedback interviews from all across our service region. Of those, 96% have indicated their satisfaction with J-U-B, GMI, and/or TLG. For those few clients who sought improvement, J-U-B continues to work for nearly all of them.